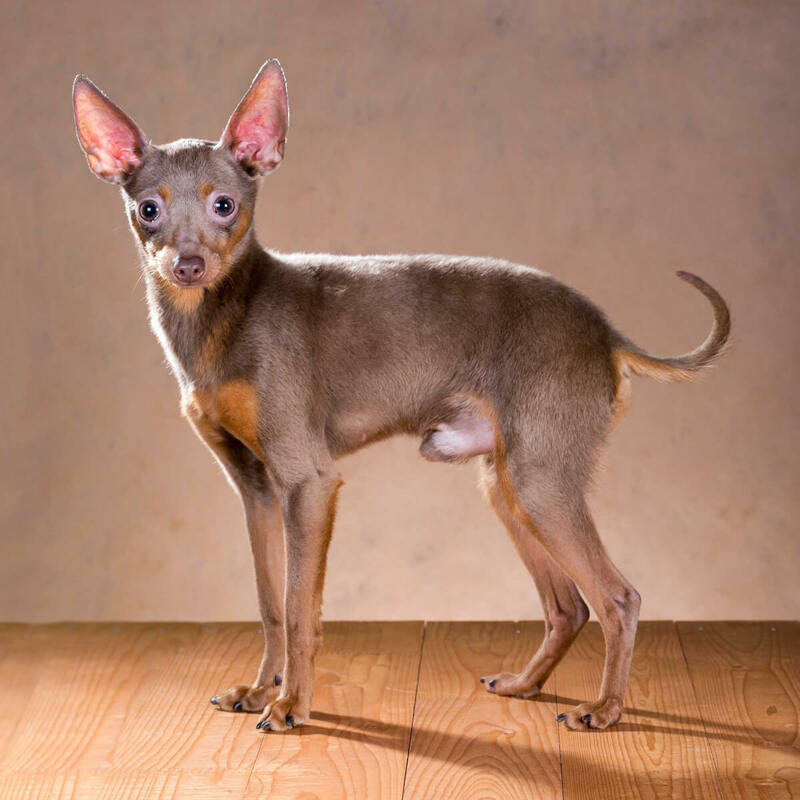 The Russkiy Toy, or Russian Toy Terrier, is a companion breed that has graced many laps over it's history-- from the aristocratic to the most humble. These dogs are happy and playful so be prepared to devote plenty of time and energy to them daily. 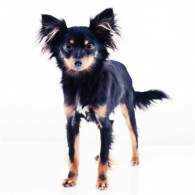 This is an indoor breed that does best with owners without children or that has older children due to their fragility. Some are outgoing others are reserved, but you can bet they will be an excellent watchdog. Exercise needs are modest, while grooming requirements are moderate and with plenty of toys (and attention) this fairly healthy breed will be around 10-12 years or more. Small English Terriers had made their way to Russia by the early 1700's-- the most well known example belonging to Peter the Great. As the popularity of anything English grew during the 1800's, so too did the popularity of these little English Toy Terriers; the breed was a favorite among the aristocratic ladies of the period. Although almost exterminated during the Communist revolution (1917) by the mid 1950's there was an effort to revive the breed. Only after this time did the development of the second (long-haired) coat type become standardized. Overall, the Russkiy Toy gives an impression of an elegant little companion dog-- thriving off attention while being perpetually cheerful and active. They are often described as similar in appearance to Chihuahuas, however, the head is not so apple shaped, the batlike ears are even larger and the muzzle more long and narrow. These tiny dogs weigh up to six pounds and come in both short and long haired varieties. This section will give you the 101 on the Russian Toy Terrier dog, especially in regards to information on her intelligence, temperament around others and maintenance needs. 1. 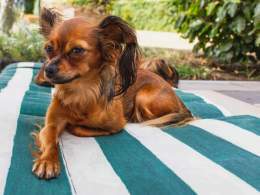 Intelligence- These are smart little dogs that can learn quickly if trained by a firm owner that doesn't allow them to run the household or treat them like babies. They should be socialized early with people and pets. Teaching them not to jump off furniture can prevent many injuries to this fragile breed. 2. Kids, Strangers, Pets- Some Russkiys will be outgoing but many will remain aloof and reserved around strangers, thus why early socialization is important. Due to their vocal nature they do make excellent watch dogs. They do best in households with no or older children since they are not tolerant of rough play. Most are fine with other pets. 3. Maintenance- This breed may be perpetually lively but it's easy to give them the exercise they need. A few walks, some games with toys and playtime is a yard is all acceptable; they will be active indoors. This breed excels at agility activities. If not given enough attention they are prone to separation anxiety and they do require frequent brushing and bathing. 1. Short-haired Russian Toy Terriers have coats that are glossy, close-lying and, as the name implies, short. 2. Long-haired Russian Toy Terriers have coats that are medium-long and straight to wavy. There is feathering on the backs of the legs and ears whereas the feet are heavily covered. The only areas on this coat type that are short are on the head and front of the legs. The Russkiy Toy temperament is active and playful, not to mention attention loving. Whether sitting on the couch or tearing around the yard, this breed wants to do it with you. They make perfect companions if you have enough time for them and are able to treat them like a beloved pet instead of a baby; otherwise you may find yourself frustrated by a destructive dog experiencing separation anxiety or Small Dog Syndrome. Russian Terriers are certainly vocal and are said to bark more than Chihuahuas, which is excellent if you want a watch dog but not so much if you have close neighbors. With strangers they may be reserved but are capable of warming up after establishing the person is not a threat. Most get along well with other pets but they do best with older children if going into a family setting. Young ones may play a little to rough for this fragile thing and your Russkiy Toy may not tolerate being mishandled. Finally, members of this breed are pretty intelligent and trainable, even by a first timer! The key is to treat them as a pet (not a baby) and be patient, yet firm. They are known for being a bit testing and stubborn at first but after they begin to listen, they actually excel in any type of training (especially agility). Below are pictures and images of the Russkiy Toy (Russian Terrier) dog breed. Russian Toy dogs live about 10-12 years, on average, but it's not unheard of for them to live up to 15 years! 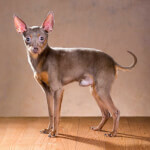 Although they are tiny, delicate dogs with associated fragility of similar breeds, they are otherwise pretty healthy. 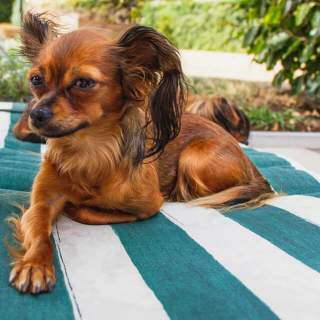 Patellar luxation is a common issue that is inherited from the parents so make sure to choose a reputable breeder that offers proof of any certifications and testings done on the parents. Also, your Russkiy Toy may have issues with her baby teeth not falling out-- in which case you may need to take them to the veterinarian for removal since this can cause disease of the teeth and gums.